Home / Christian / Motivation / Does Good People Suffer? Have you ever regretted giving a testimony? When I was 19 years old, I prayed really hard to get into a scholars programme at a local university. Only three per cent of the undergraduate cohort was accepted into the programme each year. Eventually, I was accepted despite not having straight As in my examination results. So I gave a testimony at a cell group meeting, thanking God for opening the door of opportunity. But later, in my first and second semesters, my grades were not good enough and I was sent warning letters—twice. Essentially, the message was: buck up or you could be kicked out of the programme. I reasoned that I had not adjusted to university life in the first semester. I reflected on my study approach and tried to work harder and smarter. This included not selecting university modules in which the exam dates were very close to one another and trying to better manage my time. I thought the situation would improve. But that did not happen, and the second warning letter came as a huge blow. I had never received any warning letter in my entire schooling life; now I’d received two. To the best of my knowledge, I had done whatever I could and had put in my best effort to get better grades in the second semester. So I was genuinely baffled by my final grades after the examinations. I failed to understand why my grades turned out the way they did, despite all I had done. Sure, I was not expecting a perfect score, but I expected to do relatively well. I searched my heart and was convinced I had done my best. I tried blaming professors—I even asked for a marking review for one of my exam scripts, but the grade did not change. Eventually, I blamed God, the one whom I had prayed to for good results. At the time, I regretted giving my testimony earlier. And I struggled to make sense of my situation. I had not taken His gift—the opportunity of entering the scholars programme—for granted. So why would God take away something He gave? And unlike the lyrics in the song “Blessed Be Your Name”, my heart chose not to bless God’s name. Admittedly, neither the Bible nor the church was the first place I turned to for answers. I wasn’t sure how people would respond when I said I was blaming God. So I turned to Google, typed “disappointment with God”, and discovered a book of the same title by American Christian author Philip Yancey. After reading the book, in which Yancey delved into the book of Job, as well as other Old Testament books where prophets cried out to God, I gained a greater appreciation of God’s ways. Yancey writes that the book of Job “portrays the very worst things happening to the very best person”. Job was blameless and upright, and he feared God and shunned evil (1:1). God said so himself, and said there was no one on earth like Job (1:8, 2:3). But within a day, Job lost his oxen, donkeys, sheep, camels, and all his children (1:14-19). On another day, he suffered painful sores all over his body, from head to toe (2:7). His three friends Eliphaz, Bildad, and Zophar suggested that his suffering was because of some sin he committed, but God rebuked them for speaking wrongly (42:7). 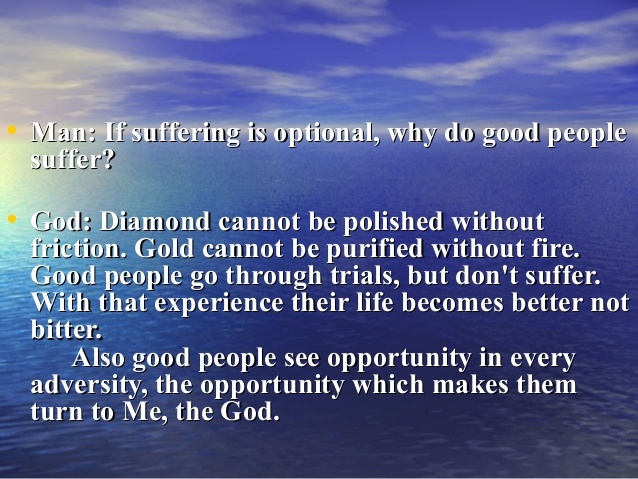 God also did not mention any specific sin as a reason for Job’s suffering. Not all suffering we go through is because of our sin. For some of us, the reminder we need is: “it’s not your fault”. People sometimes fare badly at school or work because they did not work hard enough, but that’s not always the case. Perhaps you have had a similar experience to mine: you thought you studied hard, spotted the right topics, did everything you could, but it still wasn’t enough to meet the grade. Even in schoolwork, the formula for success does not always look like this: more revision time (or assessment books or tuition) equals better grades. Job’s suffering started because of a conversation between God and Satan. Yancey writes that the conversation resembled a wager, a bet. Satan claimed Job was loyal to God as he had been blessed, and accused Job of being a fair-weather believer (1:10-11). Satan’s challenge to God: destroy everything Job has, and he will surely curse you (1:11, 2:5). God’s response: challenge accepted, but spare his life (1:12, 2:6). And that’s when Job lost everything. “Job was unknowingly performing in a cosmic showdown before spectators in the unseen world,” writes Yancey. The Bible records other examples of human actions having an impact on the unseen world: a mission trip by the disciples causes Satan to “fall like lightning from heaven” (Luke 10:1-18); a sinner’s repentance is cause for celebration in heaven (Luke 15:7). It’s hard to imagine that a single person’s response would matter in the spiritual realm, but that’s what the book of Job shows. Our response to testing matters. Job’s test was to trust God in spite of all that happened, to keep the faith. In my case, I believe my test was facing the risk of being kicked out of the scholars programme that I wanted so much to be a part of. Would I still be faithful? Or would it show that I was just a fair-weather believer? I do not know if my response to the testing of my faith affected the spiritual realm, but I believe that it pleased God (Hebrews 11:6). I believe my response also mattered to Him because it refined my faith and deepened my relationship with God. Today, years after this incident, I can say I have been less shaken when faced with other times of suffering, when it seemed as if God had taken away what He gave. I still cried for nights when my church mentor (whom God placed in my life) strayed away from the faith and left church. I also cried when my family member suffered a miscarriage after God gave a young life in her womb. If my faith were to be likened to a house, it shook when faced with these tough times, but it did not collapse, because my foundational belief in the goodness of God was now stronger. 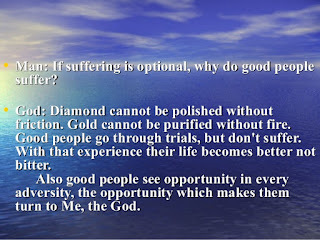 God did not answer Job’s “why me” question. Instead, God asked Job many questions, using Job’s ignorance of the natural order of the earth God created, to reveal his ignorance of God’s moral order (Job 38-41). Job’s reply: “Surely I spoke of things I did not understand, things too wonderful for me to know” (42:3). So I learned to confess my disappointment, doubts, and questions to God, like what Job did (e.g. 7:11-21, 10:2-18). I chose to continue taking on added responsibilities in church, while admitting my fears to God about how this would affect my time to study and my grades. By God’s grace, my grades miraculously improved in my third semester at university, a semester in which I walked through my disappointment with God. The truth is, we are humans, not God. Our perception of time and space is different from that of an omnipresent God who views time as eternity, a never-ending present. By God’s grace, I gave another testimony after my third semester, not just of the material blessing of an improvement in grades, but also of God sustaining and refining my faith through it all.